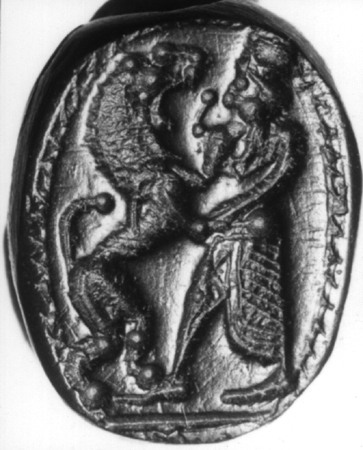 This is an important subject, clearly related to those examples in the series where the lion-fighter seems to be Heracles, but taking precedence since this is an eastern motif and there are indications, though puzzling, of identification. 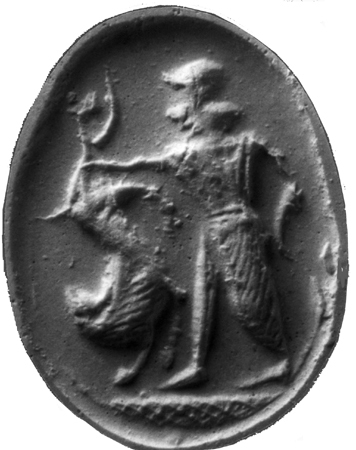 There seems a real distinction between Type A, in which the figure wears a conical headdress or mitre and usually wields a weapon, and Type B in which the figure has a flat-topped cap, in proportion but not detail like a Persian crown. 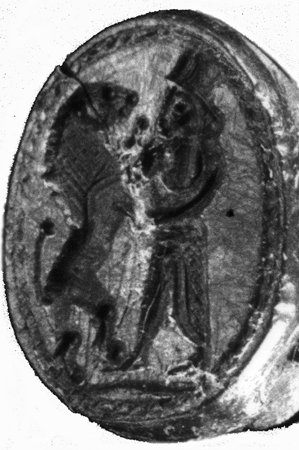 The subject occurs also on Persian seals. 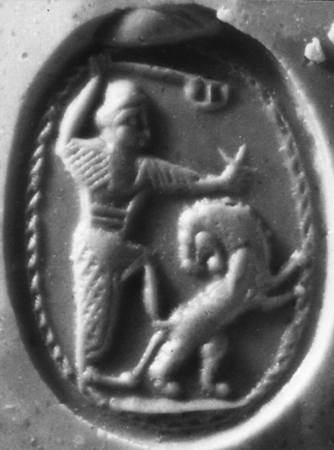 The king commonly extends his hand over the lion and is presumed to be holding the creature's forelock, as in scenes where the opponent is human (18), but the gesture is less explicit and the hand with the grasped hair sometimes misplaced. 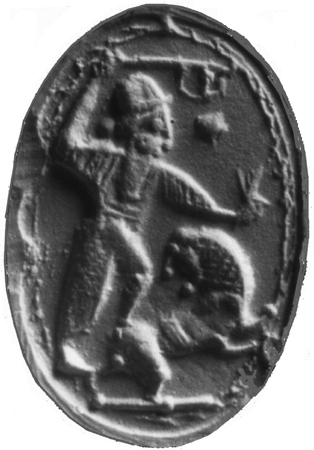 The king is bearded and normally wears dress of Assyrian type with one leg bared and, on the better pieces, a curved outline to the cloak covering the other leg. There are simpler variants. 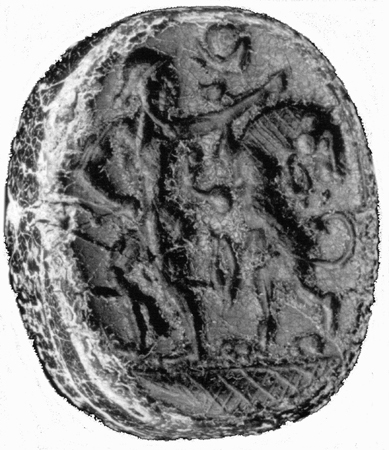 19/5 R. Arcais Coll., from Tharros. Marmora, pl. B 75. BH;EXO. The group as the last. 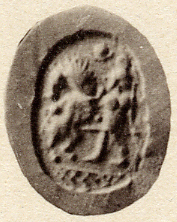 Flat crown in the drawing, but perhaps inaccurate. 19/10 Nicosia D.5. BL;EXZ. Reyes, no. 119. Naked figure? 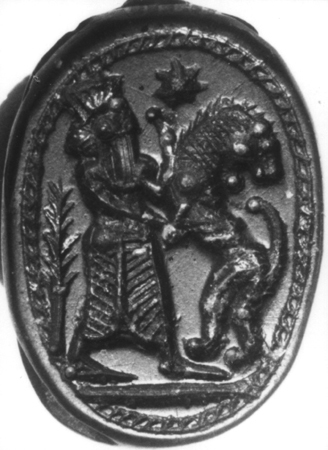 before rearing lion. 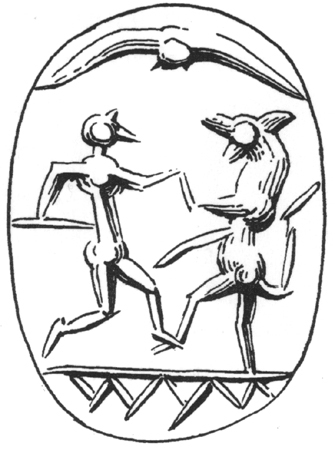 Winged disc above. 19/13 Paris, BN 1026. Scaraboid. Menant, II, pl. 9.9. BL; double groundline. 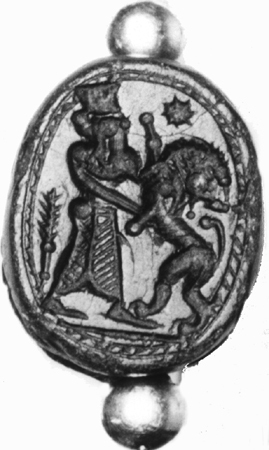 King confronts rearing lion; staff (?) in lowered hand. 19/16 Oxford III, no. 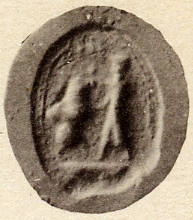 475 (1889.390), from Syrian coast. Nunn no. 51. HB;EXCR. 19/20 New York market. Christies 8.6.01, no. 232. BL;EXCR. 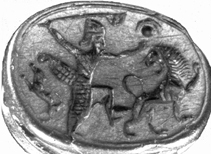 The king holds a sword, and treads down the lion which turns away, head averted, holding its forelock. Above, star and a dumpy winged disc. 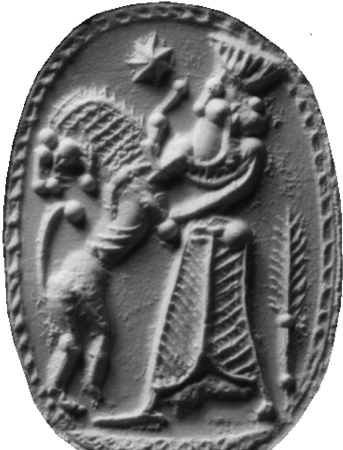 The crown is sometimes striated to resemble the Persian crown, or it is shapless but not pointed. 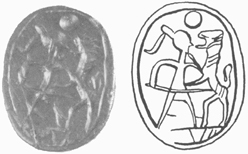 The dress usually covers both legs and may be patterned as on many Persian seals, but at least once is divided as in Type A. 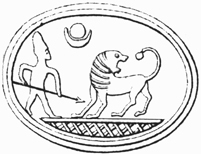 The usual scheme is for the lion to be rearing before the king who grapples it; weapons are not prominent but the addition of a tree and star is common. 19/25 Como, Mus.Civ., from Tharros. RSF 6 (1978) pl. 5.2 (Pisano); AttiFP II, pl. 86.1. BH; on a gold hoop B. 19/29 Lord Vernon Coll., from Tharros. Marmora, pl. 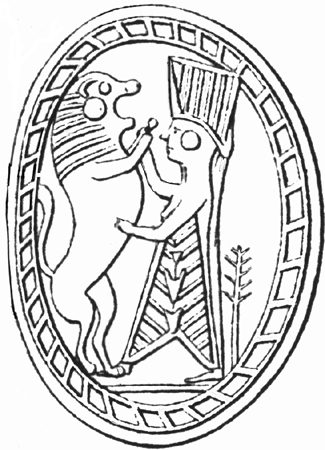 B 74. BH;EXO. Tree behind. 19/32 Cologne, Kunstg.Mus., once Treskow. BH;EXO. Lion head averted; tree behind, star above. 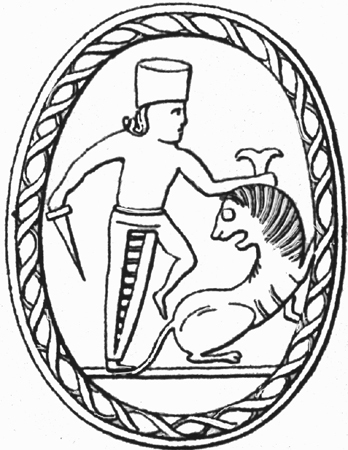 19/33 Zurich market, NAAG Cat. 7 (1991) no. 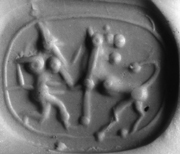 69; Syria 76 (1999) 265, fig. 46. As (? =) the last. 19/34 Cambridge, Lewis Coll. M. Henig, The Lewis Collection of Gemstones (1975) no. 263. BL. Lion head averted. 19/41 Spano Coll., from Tharros. Marmora, p. 130. 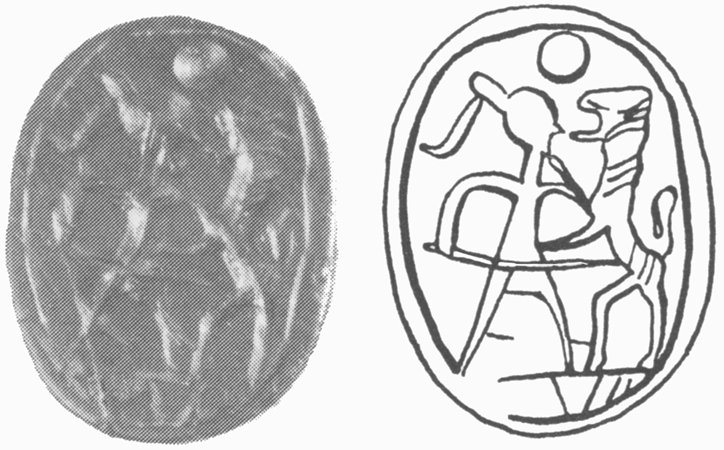 On gold mount and hoop A. EXCR. Egyptianizing. 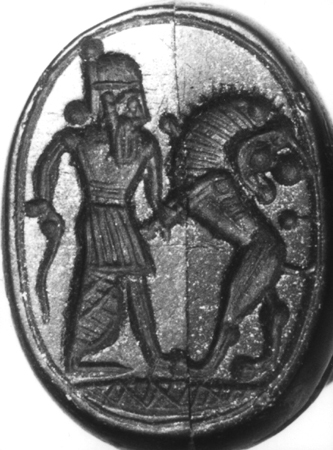 Small figure with short skirt grapples large rearing lion round waist; uraeus behind. 19/46 Rome, NM 52380. RPA 30-31 (1957/9) 226, fig. 4. BL;EXZ. 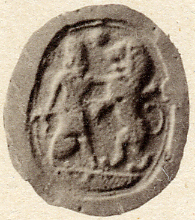 Dressed figure faces rearing lion. 19/47 Zurich market, NAAG Cat. 7 (1991) no. 68. 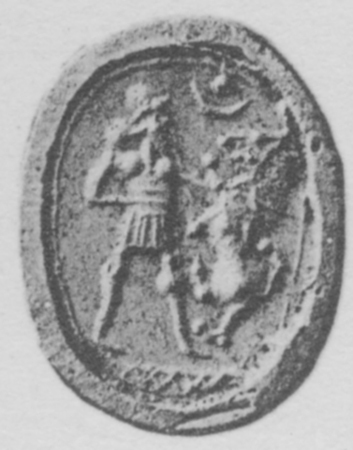 Syria 76 (1999) 265, fig. 45. BL;EXO. 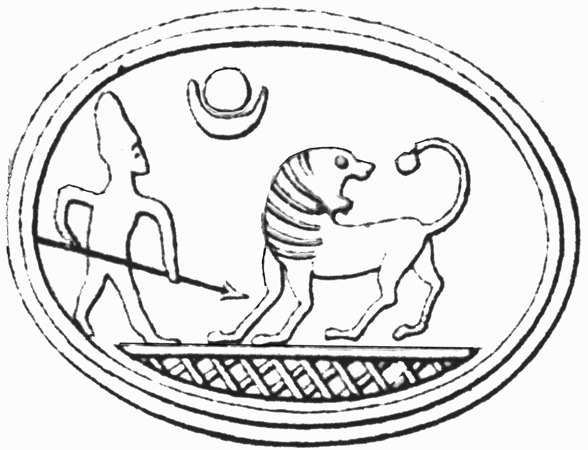 Man with pointed cap, short dress, faces rearing lion; disc-and-crescent behind, star above. 19/X1 Boston 27.762, LHG no. 9, pl. 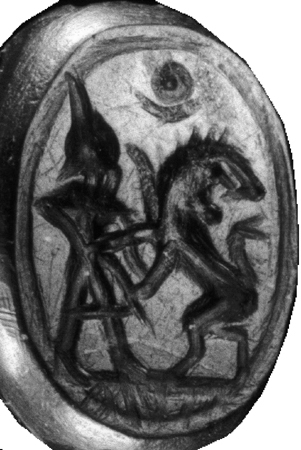 2, from Tharros. AG pl. 61.12; RSF 4 (1976) pl. 9.3 (Culican). Cornelian. 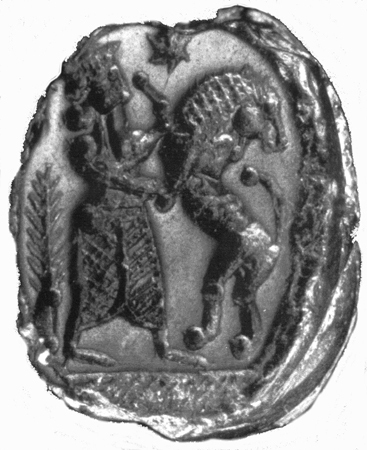 BL; in gold mount. 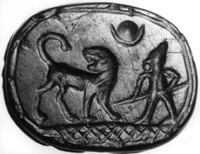 King in pointed helmet with raised axe pursues lion who runs over the prostrate figure of a naked humanoid, lying on a cross-hatched area, like a displaced exergue. 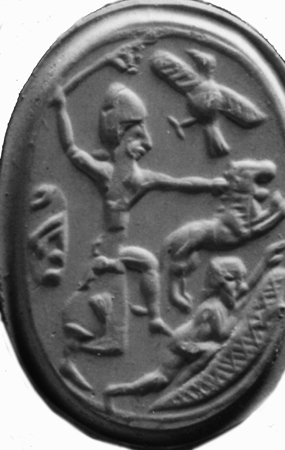 Flying bird above; a squatting ape (not a plain cartouche) behind. Some indecipherable patterns on the king's dress (a floral, an animal?). 19/X2 New York, Rosen 62. Black steatite scaraboid. BL;EXnb. 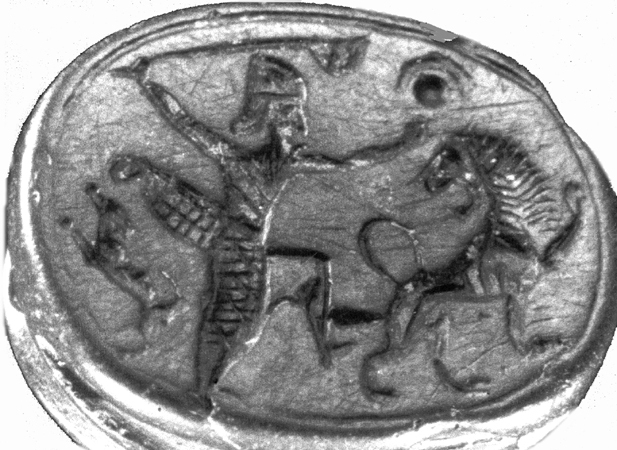 A man fights a rearing lion; his body is turned away, and he is naked, with no weapons, thus unlike any of the standard lion-fighting schemes in the series. Device? 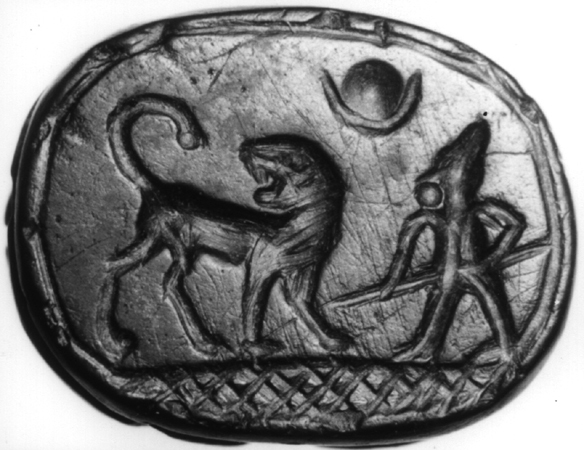 between; disc-and-crescent above.